Preheat oven to 350F/175C. Chop onion and green pepper. Heat 2 tsp. olive oil in a non-stick pan, then saute onion and pepper for 3-4 minutes, until just starting to soften. Add minced garlic and saute about 1 minute more, being careful not to brown the garlic. Remove the onion, pepper, and garlic mixture to a bowl. Add 2 tsp. more olive oil to the pan. Crumble in the ground beef and ground turkey, season with Spike seasoning, and cook over medium heat until the meat is well browned. Tilt pan to see if there is any extra fat, and remove with a spoon if there is, then stir cooked vegetables and garlic back into the meat. Add tomato sauce and simmer until the mixture has thickened and liquid has cooked off, about 10 minutes, then turn off heat. Spray baking sheet with nonstick spray and stand up zucchini cups, open end up. 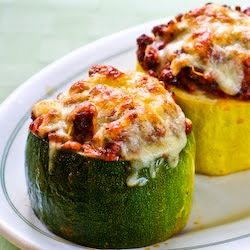 Stir 1 1/2 cups grated cheese into the cooled meat mixture (it doesn't need to be completely cool), then spoon the meat-cheese mixture into zucchini cups, pressing down with the spoon and mounding it up a little over the top of the zucchini.